Sorry but we can only ship Moroccanoil products to certain countries. For more information about where we ship to please contact our customer service team. 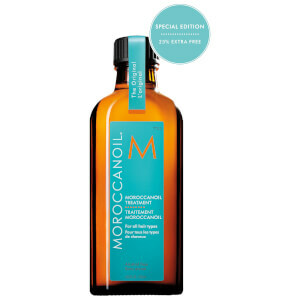 This multi-functional treatment by Moroccanoil can style, finish and condition your hair all in one. The 125ml treatment tackles frizzy hair, detangles even the most stubborn locks and makes your hair feel completely smooth. Infused with antioxidant argan oil, strengthening proteins and shine-enriching vitamins, this treatment is ideal to soften your hair or to help make it more manageable. Your hair becomes easier to manipulate and style as you like it, without leaving an oily residue. For styling and finishing: Apply a small amount on your palms and work through the lengths and ends of damp hair after shampooing. For protection: Apply a small amount to the lengths and ends of dry hair to protect against damage caused by the sun, wind, and other harsh environmental elements. Before colouring: You can use the Moraccanoil Treatment before applying colour to your hair. Gently massage the treatment into your hair and leave in when applying colour or other treatments. For hair extensions: Use a small amount to help detangle wig and hair extensions. This is the second I bought! It's pretty good for every kind of hair. Use it after washing, the smell is nice and mild. Though it's oil, it won't make your hands uncomfortable. Nice choice, if you want sonething to protect and improve your hair quality!